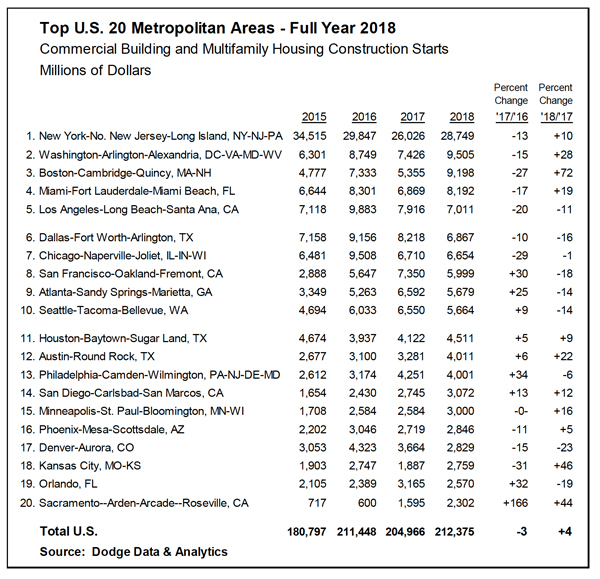 NEW YORK – February 12, 2019 – The leading U.S. metropolitan areas for commercial and multifamily construction starts registered a varied performance during 2018 compared to the previous year, according to Dodge Data & Analytics. Of the top ten markets, ranked by the dollar amount of construction starts, four reported greater activity in 2018 while six showed declines. For the metropolitan areas ranked 11 through 20, seven reported gains while three reported declines. At the national level, the volume of commercial and multifamily construction starts in 2018 was $212.4 billion, up 4%, which represented a moderate rebound after a 3% setback in 2017. The New York NY metropolitan area, at $28.7 billion in 2018, continued to be the leading market in the U.S. for commercial and multifamily construction starts, advancing 10% after its 13% drop in 2017. New York NY’s share of the U.S. total was 14% in 2018, up from 13% in 2017, although not as high as its peak 19% share reported in 2015. The next three markets in the 2018 top ten all showed gains relative to 2017 – Washington DC ($9.5 billion), up 28%; Boston MA ($9.2 billion), up 72%; and Miami FL ($8.2 billion), up 19%. The remaining six markets in the top ten with their declines relative to 2017 were – Los Angeles CA ($7.0 billion), down 11%; Dallas-Ft. Worth TX ($6.9 billion), down 16%; Chicago IL ($6.7 billion), down 1%; San Francisco CA ($6.0 billion), down 18%; Atlanta GA ($5.7 billion), down 14%; and Seattle WA ($5.7 billion), down 14%. For the metropolitan areas ranked 11 through 20, the seven showing greater activity in 2018 relative to 2017 were – Houston TX ($4.5 billion), up 9%; Austin TX ($4.0 billion), up 22%; San Diego CA ($3.1 billion), up 12%; Minneapolis-St. Paul MN ($3.0 billion), up 16%; Phoenix AZ ($2.8 billion), up 5%; Kansas City MO-KS ($2.8 billion), up 46%; and Sacramento CA ($2.3 billion), up 44%. The three metropolitan areas in this group with decreased dollar amounts of commercial and multifamily starts in 2018 were – Philadelphia PA ($4.0 billion), down 6%; Denver CO ($2.8 billion), down 23%; and Orlando FL ($2.6 billion), down 19%. The commercial and multifamily total is comprised of office buildings, stores, hotels, warehouses, commercial garages, and multifamily housing. Not included in this ranking are institutional building projects (e.g., educational facilities, hospitals, convention centers, casinos, transportation terminals), manufacturing buildings, single family housing, public works, and electric utilities/gas plants. The 4% increase for commercial and multifamily construction starts at the U.S. level in 2018 reflected greater activity for multifamily housing, up 8% to $95.1 billion, and the commercial building categories as a group, up 1% to $117.3 billion. Multifamily housing in 2017 had fallen 8% after appearing to have reached a peak in 2016, before posting the 8% rebound in 2018. After surging 23% in 2016, commercial building starts have shown slight improvement, edging up 1% in both 2017 and 2018. The New York NY metropolitan area in 2018 registered a 10% gain for commercial and multifamily construction starts to $28.7 billion, bouncing back after a 13% drop in 2017. Most of the upward push came from the commercial project types, which climbed 22% after sliding 27% in 2017. Office construction starts advanced 22% in 2018, led by groundbreaking for the $1.8 billion Spiral office building and the $480 million addition to the Hudson Commons office building, both in the Hudson Yards district of Manhattan. Other noteworthy office starts were the $250 million gut rehabilitation of the former Domino Sugar Factory and the $233 million office portion of the $300 million One Willoughby Square mixed-use development, both in Brooklyn. New hotel construction starts were particularly strong in 2018, jumping 118% with the lift coming from the $300 million Tribeach Holdings Hotel in Manhattan and the $218 million hotel portion of the $400 million Resorts World Casino and Hotel expansion in South Ozone Park. Store construction starts improved 4% in 2018, reflecting groundbreaking for a $70 million shopping center in Staten Island, while new warehouse construction starts retreated 27%. Multifamily housing in the New York NY metropolitan area edged up 2% in 2018 following a 1% gain in 2017, as construction starts have shown slight growth since the 27% correction that was reported back in 2016. Leading the way for multifamily housing in 2018 was the $700 million City View Tower at Court Square and the $550 million Queens Plaza Park Apartments in the Long Island City section of Queens, the $600 million 85 Jay Street and the $375 million Hoyt Street high-rises in Brooklyn, and the $250 million Journal Squared 2 high-rise in Jersey City NJ. During 2018, there were 24 multifamily projects valued at $100 million or more that reached groundbreaking, the same as the 24 such projects that reached groundbreaking in 2017. After sliding 15% in 2017, the Washington DC market rebounded 28% to $9.5 billion in 2018, with similar construction start gains for commercial building, up 30%; and multifamily housing, up 26%. The commercial upturn was led by a strong performance for the office category, rising 36% with the lift coming from eleven data center projects totaling $1.6 billion located in northern Virginia. In addition, there were several more typical office building projects that reached groundbreaking in 2018, led by the $475 million office portion of the $600 million Marriott Headquarters and Hotel in Bethesda MD, the $245 million U.S. Citizenship and Immigration Services building in Suitland-Silver Springs MD, and the $160 million M Street NW office building in Washington DC. The hotel category climbed sharply in 2018, with construction starts rising 194% as the boost came from the $77 million hotel portion of Bethesda’s Marriott Headquarters and Hotel and a $50 million renovation of the W Hotel in Washington DC. Warehouse construction starts in 2018 increased 46%, while store construction starts were flat. The 26% increase for multifamily housing in 2018 followed a 23% decline in 2017. There were five multifamily projects valued at $100 million or more that reached groundbreaking in 2018, led by the $380 million Highlands residential towers in Arlington VA and the $185 million Apex residential towers in Bethesda. The Boston MA metropolitan area surged 72% to $9.2 billion in 2018, following a 27% decline for commercial and multifamily construction starts in 2017. Similar gains were reported for commercial building, up 73%; and multifamily housing, up 71%, as groundbreaking for the $1.3 billion Winthrop Square Tower in Boston boosted both construction segments. Office construction starts in 2018 increased 102%, led by the $644 million office portion of the Winthrop Square Tower. Additional large office projects that started in 2019 were a $150 million office building in Cambridge and an $88 million office building addition in Boston. The hotel category climbed 139% in 2018, led by the $450 million Omni Seaport Hotel in Boston. Store construction starts improved 38% in 2018, while warehouse construction starts retreated 26%. The 71% jump for multifamily housing in 2018 came after a 32% decline in 2017. There were seven multifamily projects valued at $100 million or more that were reported as construction starts in 2018, led by these Boston projects – the $580 million multifamily portion of the Winthrop Square Tower, the $215 million Garden Garage apartment building, and the $188 million 159 Washington St. multifamily complex. Commercial and multifamily construction starts in the Miami FL metropolitan area increased 19% to $8.2 billion in 2018, strengthening after a 17% drop in 2017. The upward push come from multifamily housing which rebounded 43% following its 45% slide in 2017. There were 11 multifamily projects valued at $100 million or more that reached groundbreaking in 2018, compared to five such projects in 2017. The largest multifamily projects in 2018 were the $300 million One River Point condominium tower and the $213 million Aston Martin Residences, both in Miami, and the $165 million multifamily portion of the $330 million Las Olas Avenue mixed-use building in Ft. Lauderdale. Commercial building construction starts improved 1% in 2018, rising slightly after stronger growth in 2016 (up 28%) and 2017 (up 37%). Office construction starts advanced 21%, lifted by the $139 million office portion of Ft. Lauderdale’s Las Olas Avenue mixed-use building and the $75 million office portion of the $225 million The Plaza Coral Gables mixed-use complex in Coral Gables. Warehouse construction starts in 2018 increased 29%, while store construction starts retreated 16%. Hotel construction starts in 2018 fell 27% after a 95% hike in the previous year that included the $575 million hotel portion of the $900 million Seminole Hard Rock Hotel and Casino expansion in Hollywood FL. Large hotel projects that reached groundbreaking in 2018 were led by the $83 million hotel portion of the $150 million Turnberry Isle JW Marriott Hotel and Conference Center in Aventura FL. The Los Angeles CA metropolitan area dropped 11% to $7.0 billion in 2018, as commercial and multifamily construction starts retreated for the second year in a row after the 20% decline in 2017. Decreased dollar amounts of construction starts in 2018 were reported for commercial building, down 12%; and multifamily housing, down 11%. The commercial building downturn in 2018 was less pronounced than its 22% drop in 2017, which came after 38% increases in both 2015 and 2016. Office construction starts in 2018 slipped a relatively modest 2%, as support came from the $145 million office portion of the $225 million Academy Square office complex in Los Angeles and the $85 million office portion of the $127 million Culver Studios office and support facilities in Culver City. More substantial declines were reported for warehouses, down 17%; store construction, down 38%; and hotel construction, down 43%. The commercial garage category did register a 16% gain, boosted by the start of a $135 million parking structure at Disneyland in Anaheim, plus the garage portion of several large office and multifamily projects. The 11% multifamily decline in 2018 followed an 18% slide in 2017, as this project type continued to settle back from the elevated activity reported in 2016. There were six multifamily projects valued at $100 million or more that reached groundbreaking in 2018, compared to 11 such projects in 2017. The large multifamily projects in 2018 were led by the $363 million multifamily portion of the $411 million Cumulus Apartments mixed-use complex in Los Angeles and the $342 billion multifamily portion of the $400 million Los Olivos Apartments mixed-use complex in Irvine. Following a 10% decrease in 2017, commercial and multifamily construction starts in the Dallas-Ft. Worth TX metropolitan area fell for the second straight year in 2018, retreating 16% to $6.9 billion. The downturn came as the result of a 35% decline for commercial building, while multifamily housing moved in the opposite direction with a 24% increase. The reduced activity for commercial building in 2018 was the result of diminished construction starts across each of the individual categories, including office buildings, down 48%; and hotels, down 51%. In 2017, the office category had included the start of two large projects in Ft. Worth – a $300 million Facebook data center and the $300 million American Airlines Trinity Campus. The largest office projects entered as construction starts in 2018 were a $183 million Facebook data center in Ft. Worth and the $52 million Independent Bank corporate headquarters in McKinney. Store construction starts in 2018 were down 17%, while warehouse construction starts slipped 10%. The warehouse category did feature the start of several large projects in 2018, including the $71 million Gateway Logistics Center at DFW International Airport and the $70 million Golden State Foods distribution facility in Burleson. The 24% increase for multifamily housing in 2018 showed activity rebounding after a 20% decline in 2017. The largest multifamily projects that reached groundbreaking in 2018 were the $232 million Atelier/Flora Lofts apartment tower and the $215 million Victory Park apartment tower, both in Dallas; and the $165 million Davis apartment complex in Frisco. The Chicago IL metropolitan area experienced a slight 1% reduction to $6.7 billion for commercial and multifamily construction starts in 2018. While multifamily housing retreated 28% in 2018, commercial building almost offset that decline with a 31% increase. Multifamily housing has now fallen for two years in a row, following the robust dollar amount that was reported back in 2016 which featured several massive projects, led by the $780 million multifamily portion of the $900 million Wanda Vista Tower. There were three multifamily projects valued at $100 million or more that reached groundbreaking in 2018, compared to five such projects in 2017 and nine such projects in 2016. The largest multifamily project in 2018 was the $150 million condominium project involving the adaptive-reuse of Chicago’s Tribune Tower. The 31% increase for commercial building reflected a 67% jump for office construction starts, which featured the start of these Chicago projects – a $665 million office building on North Wacker Drive and a $181 office building on West Wayman Street. The commercial garage category rose 54%, helped by the start of a $130 million parking expansion at Midway International Airport. Warehouse construction starts increased 33%, but declines were reported in 2018 for store construction starts, down 13%; and hotel construction starts, down 18%. The 18% decline to $6.0 billion for the San Francisco CA metropolitan area in 2018 came after a 30% gain for commercial and multifamily construction starts in 2017. 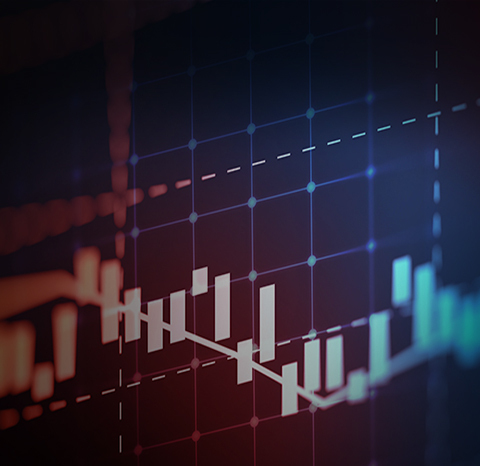 The overall pattern was shaped by the swing shown by commercial building – up 60% in 2017, followed by a 46% decline in 2018. The office category in 2018 fell 75% following its 134% hike in 2017 that reflected the start of the $780 million office portion of the $1.3 billion Oceanwide Center Tower in San Francisco and the $568 million Stanford University Redwood City office campus. In contrast, the two largest office projects in 2018 were smaller in scale – a $230 million Facebook office building and the $157 million Menlo Gateway Park office complex, both located in Menlo Park. An additional steep decline was registered by store construction starts, down 52%, while gains were reported for warehouses, up 30%; and hotels, up 130%. The hotel jump reflected groundbreaking for the $250 million Grand Hyatt Airport Hotel at San Francisco International Airport and the $112 million Berkeley Place Hotel in Berkeley. Multifamily housing stayed on the upward track in 2018, rising 23% and marking the third straight annual increase. There were six multifamily projects valued at $100 million or more that reached groundbreaking in 2018, led by two projects in Oakland – the $265 million 39th Street apartment tower and the $200 million Franklin Street apartment tower. The Atlanta GA metropolitan area experienced a 14% pullback to $5.7 billion for commercial and multifamily construction starts in 2018, following a 25% increase in 2017. Both commercial building and multifamily housing showed reduced activity compared to 2017, falling 10% and 19% respectively. The commercial total was restrained by steep declines for stores, down 30%; and warehouses, down 38%. At the same time, office construction was able to rise 2% on top of the 27% hike reported in 2017, with much of the boost coming from the start of a $750 million Facebook data center in Covington. Other noteworthy office projects that reached groundbreaking in 2018 were the $120 million Star Metals office building in Atlanta, the $97 million Avalon office building in Alpharetta, and the $80 million T3 West Midtown office building in Atlanta. Hotel construction in 2018 rose 29%, reflecting the start of the $70 million Reverb by Hard Rock Hotel in Atlanta. The 19% drop for multifamily housing in 2018 followed sharp gains in the previous two years, with 2016 up 42% and 2017 up 24%. The largest multifamily projects that reached groundbreaking in 2018 were located in Atlanta – a $165 million student housing tower, the $137 million West Marietta Street condominium tower, and the $129 million AMLI Oak Valley apartment complex. The Seattle WA metropolitan area fell 14% in 2018 to $5.7 billion, after steady growth for commercial and multifamily starts over the previous seven years, including a 9% increase in 2017. The commercial building and multifamily housing segments moved in opposite directions during 2018, with commercial building dropping 43% while multifamily housing climbed 25%. After advancing 19% in 2017, helped by such projects as the $331 million office portion of the $570 million Rainer Square building in Seattle, office construction starts in 2018 plunged 60%. The largest office projects that reached groundbreaking in 2018 were the $160 million T-Mobile Newport Corporate Center renovation in Bellevue and the $100 million Dexter Yard office complex in Seattle. Steep declines were also reported for warehouse construction starts, down 60%; hotel construction starts, down 45%; and store construction starts, down 15%. The commercial garage category was the one commercial project type able to report a gain, rising 22% with the lift coming from the garage portion of several large multifamily projects and the $46 million garage that’s part of the Washington State Convention Center expansion. The 25% increase for multifamily housing was supported by the start of seven projects valued at $100 million or more, compared to three such projects in 2017. The 2018 multifamily projects were led by the $429 million multifamily portion of the $516 million 1200 Stewart Street mixed-use tower, the $398 million multifamily portion of the $450 million Seattle Times mixed-use complex, and the $200 million Wall Street multifamily tower, all located in Seattle.